The reef consists of carnivores called polyps, which prey on small sea creatures that float by catching them with twinging tentacles. These multi-colored corals are eye-catching. Other organisms found in the reef include 500 species of fish, 45 hydroids, 65 scleritian corals, and 350 molluscs along with a great diversity of sponges, marine worms and crustaceans. The Belize Barrier Reef is a popular destination for scuba diving and snorkeling, with a wide variety of sea life, including plants and animals like coral fish and invertebrates. Much of the sea life has yet to be explored or discovered. Visitors can explore the reef, the cays, the atolls, and the caves on their trip out to the Belize Barrier Reef. As the reef is under threats due to the oceanic pollution and several other factors, measures are being taken by the concerned authorities to protect the reef. Within the Belize Barrier Reef are several protected zones, like the Great Blue Hole, a submarine sinkhole, and Glover’s Reef Marine Reserve. 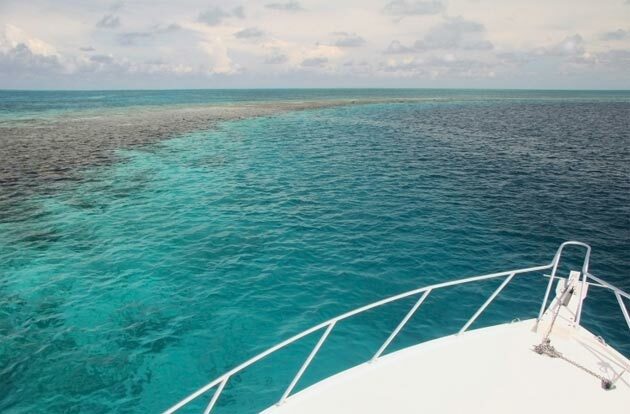 You need to either hire a boat or choose to travel in a water taxi for Barrier Reef tours. Always remember to take an expert with you for safety purposes. People visit Belize also because it is dotted with several archaeological sites of one of the world’s most mystic civilizations – the ancient Maya. You can climb up the stairs to visit the tall stone temples that offer 360-degree views of the forest or descend deep into natural caves to see the places where the Mayan kings preformed sacrifices. The Mesoamerican Barrier Reef is the third largest coral reef system in the world after Australia’s Great Barrier Reef and the New Caledonia Barrier Reef. The Belize Barrier Reserve System is a UNESCO World Heritage Site since 1996. This outstanding natural system has been found to possess 178 terrestrial plants and 247 taxa of marine flora. Where is Belize Barrier Reef? The Belize Barrier Reef is located off the Belizean coast, and the nearest city to the reef is Belize City. The nearest international airport is Philip S. W. Goldson International Airport (BZE) in Belize City, about 30 minutes from the city center. Belize is a popular destination for visitors from North America and Europe during the dry season from November to April. The dry season is also high season, however, meaning that hotels and attractions will be busy and more expensive. Hurricane season in Belize is especially rainy from July to October and most tourists stay away, so if you don’t mind the rain you could get some great bargains if you visit Belize at this time. Nearby attractions: Altun Ha, Caracol, Caye Caulker, Tobacco Caye and Old Belize.